Stunning Wooden Bowls – Thanks Dad! Artist (woodworker) to watch… Paul Baines! 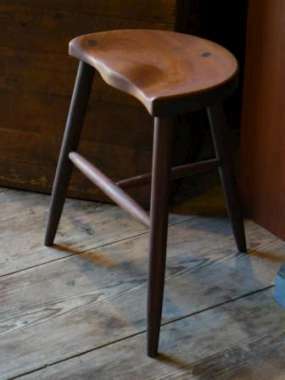 Look at this stool. It’s a work of art no doubt, but do you want to know the most delightful thing about it? It’s COMFORTABLE! What? Yep. It’s comfortable beyond belief. This is high quality furniture and I think the prices are so reasonable. The first time we sat on one of these stools was at the Port Clyde General Store. There are a variety of finishes for the seat and the legs for you to choose from. A variety of heights among other beautiful furniture… it’s truly worth checking out! My shop is located in Bowdoinham, ME 04008. We are open from 8AM – 5PM. If you are ever in the neighborhood, give us a call at 207.571.8280, or please stop by! Catch you back here tomorrow! If you get a chance check out my PHOTO BLOG!